The Arts Club of Washington is a historic home, art gallery and wedding venue that is located in Northwest DC. It is known for it's support of the fine arts, visual, literary, and performance. This mansion, located on I Street, was once the home of President James Monroe. The well appointed decor is a perfect fit for your stately wedding celebration. The Arts Club is perfect for intimate weddings or larger affairs. The Monroe Parlor and Dining room can accommodate up to 50 guests for a seated meal. The Arts Club Garden is perfect for a summer wedding. With a tent over the brick paved patio, you can invite up to 150 of your friends and family to join you for your nuptials. The salon and rear parlor, located on the second level of the club, is roomy enough for cocktail hour along with passed appetizers. This is especially helpful if the caterers need to flip the space after your vows in the Monroe Gallery. you can reserve the front room of the MacFeely Gallery if you choose for a bridal dressing room. 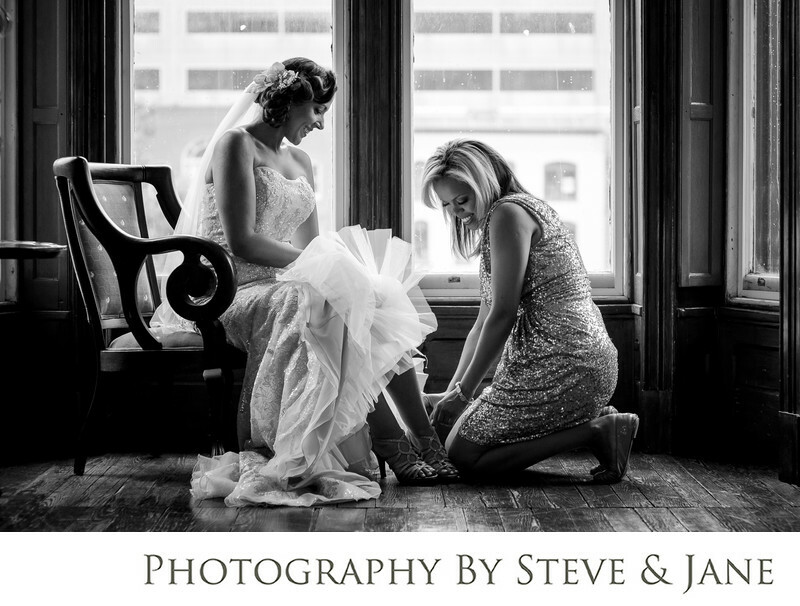 This photo was captured in the room just after this bride's stylist had put the finishing touches on her hair and makeup. The light is beautiful in this space whether it's raining or a cloudless day. There is plenty of space to accommodate a larger bridal party while they get ready to stand by your side as you vow your life to your fiancé. Location: 2017 I St NW, Washington, DC 20006.